)The climbers will haul the logs to the top and construct their portion of the installation. NOTE: The A-frame is constructed in the same manner as taught in A-FRAMES. The suspension traverse rope is located in the upper V (apex) of the A-frame. The A-frame can be placed under the static rope before or after the rope is tensioned. The latter way is better on a long suspension traverse as it helps tension the rope further. An over the object clove hitch is tied in the middle of a sling rope and placed over one pole at the apex. one pole at the apex. NOTE: As you can see from the figure above, the A-frame should be inclined forward on the edge of the cliff face, this is done to offset the strain on the A-frame to stop it from collapsing forwards or backwards. The approximate angle is between 45-60 degrees. TRANSITION: Now that we have discussed use of an A-Frame, are there any questions? Let us now discuss the use of a tree to gain height. a. Select a branch that has not been chopped, burned or is rotten. b. The branch must be at least 6" in diameter or of suitable thickness to support the intended load. c. The branch should be at a sufficient height to offer adequate clearance for the load. 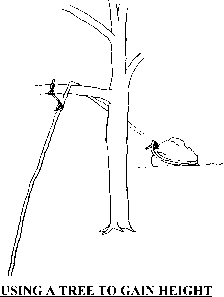 A suitable anchor point must be located behind the intended branch and in relation to the direction of pull of the load. 3 To secure the rope in place over the branch, use a sling rope and tie a clove hitch around the branch. Secure the pigtail of the sling rope to the rope installation by tying end of the line prusiks. This will prevent the rope from rubbing side to side and also function as the third leg. TRANSITION: Are there any questions regarding the use of a tree to gain height? If not, let's talk about the use of personnel. a The edge of the obstacle must be buffed to prevent unnecessary abrasion to the ropes. b The weight of the load must not exceed 100 lbs. 9 The personnel handling the load must be secured to the cliff with a safety line. TRANSITION: Are there any questions over the use of personnel? Let's discuss the technique used to attach loads to the static line. a Ensure that the belay line is established at the top of the bridge with an adequate anchor, braking system, and a safety prusik. b Tie a figure eight loop at the end of the belay line, and attach it with a carabiner to the load. 3 Twelve to eighteen inches from the end of the belay line tie another figure eight loop and attach this loop to the bridging line with a carabiner. d Using web runners and aluminum carabiners girth hitch the web runners to the belay line, and clip into the bridging line at intervals of approximately 15 feet. This is to ensure that the belay line doesn't sag excessively and tangle in trees or on rocks. TRANSITION: Are there any questions over the construction of the belay line? When lowering gear, a belay system must be used. The Marine assigned as the belay man plays a very important role. Let us now discuss the operation of the suspension traverse. ^^Supervision of the construction of the installation. ^^Control of the load being lowered and raised. ^UDeploys wed runners on the belay line. Ensure that the brakes are employed properly. ^^In command of the mule team. b| Lowering. Whenever a load is lowered down a suspension traverse, a belayer and a belay line are used to control the load. Ideally the belay man should observe the load being lowered. If this isn't possible, the belay man will receive his commands from the Point NCOIC. )To make the single carabiner brake, two small carabiners are hooked to the anchor point, opposite and opposed. Two more carabiners are locked, gates to the right, to the first set. The last sets of carabiners are placed across the body of the second set, gates down and right. L^^If the gates were against the ropes, the rope action would in time unlock the carabiners, with dangerous consequences (if using locking ovals). ]The carabiner brake is a good method for lowering a load due to lots of friction and good control, but the carabiner brake does not make for a good raising system because of the large amount of friction. This will make unnecessary work for the mule team. NOTE: If the loads require more or less friction, you can add or take away the carabiners, which are placed across the body. :igure 8. The Figure 8 rappel device is the easiest method for belaying a load. ^Thread a bight of the belay line through the large "O" ring and pull it over the small "O". b^HClip a locking carabiner through the small "O" ring and attach it to an anchor point. raking is conducted in the same fashion as in rappelling. ^BMunter Hitch. The Munter Hitch is a good brake because of the minimal gear required. Use with heavy loads. ^HStitchPlate. The stitch plate is a user-friendly device that offers quick attachment and removal. Unlike some other belay techniques, the stitch plate has no rope on rope friction. This system can be used for all load sizes. Safety Brake. For added security, an end of the line friction knot is attached to the belay line in the front of the braking device. The safety brake will have it's own anchor point. One man is tasked with the operation of the safety brake. 9 Raising the load. If a large amount of heavy weapons, ammunition, or other logistical equipment is to be moved over an obstacle, a suspension traverse is the most expedient method we can use. Because part of the weight of the supplies to be lifted will be carried by the static line. This is not true in a vertical hauling line where all the weight is suspended vertically. The main method of raising supplies is by utilizing a "Mule Team". This is a group of men 6 or more who will do the lifting. MBTo establish a mule team, the belay/haul line is run through a pulley or a steel locking carabiner at the top of the system, just as for lowering. NOTE: This is why choosing a belay device that is suitable for the load and can be removed quickly is so important. i^^If the cliff head does not afford an open area for the mule team to operate directly back, the haul/belay line can be re-directed. The line is then led away at an angle to a cleared area. * The rope should be held unless specifically ordered to lay it down. 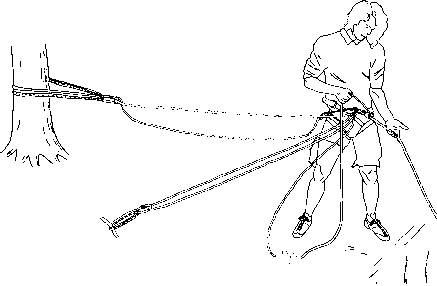 Also the use of the prusik braking system on the belay rope is necessary, in the event that the mule team lose control of the rope. * As with all installations requiring commands, some form of tactical commands need to be established. Those can be established by unit SOP. TRANSITION: Now that we have discussed the commands, are there any questions? We will now discuss load considerations. 9| (5 Min) GENERAL LOAD CONSIDERATIONS. The type of equipment that needs to be lowered or raised will range from weapons to ammunition, personnel to litters, all of which need to be handled differently. a. Weapons. Normally the types of weapons that would have to be raised or lowered are the crew served weapons organic to a rifle battalion, i.e. 81mm Mortar, 50 caliber machine gun, dragon etc. The basic method of securing these weapons is accomplished by using two sling ropes and tying a clove hitch to the front and rear of the weapon. A figure of eight is then tied into the ends and attached to the suspension traverse. The belay line is now attached to the load. b Ammunition/Equipment. The articles to be moved are to be secured through bundling or banding them together. A rope is then taken and tied around the equipment in a package_wrap fashion. The rope is wrapped one time around the bundle, then when the rope is brought back together; the ends will be crossed and wrapped around the remainder of the bundle (90 degrees to the previous wrap). This is then secured by using a square knot with two over hands and attached to the carrier rope by a steel locking carabiner. HfiTo attach the belay line to the litter you tie a figure of eight loop at the end of the belay line, then attach it to the lower body pre-rigs. Then tie a second figure of eight loop approximately four to five feet from the first figure eight loop, and attach it to the upper body pre-rigs. NOTE: Make sure that when you are doing this, that you are at a safe distance from the edge of the cliff head, and the brakeman is on belay. this stage it is worth checking and adjusting the length of the pre-rigs, to ensure that the casualty's head is higher than his feet. Once all that is done and checked, the belay line is taken tight and the litter is attached to the suspension traverse, the lower body carabiner is attached first, followed by the upper body carabiner. This is awkward to do. The helpers must have a safety line on while moving around at the cliff head. efore you start to lower, a last minute safety check is essential to ensure that carabiners are locked, knots are secure, casualty is secure, that the brake man is on the brake and the safety man is manning the prusik. Now you can commence lowering or raising the casualty. d Personnel. Personnel will wear a rappel seat clipped into the belay line. TRANSITION: Are there any questions about load considerations? If there are none for me, then I have some questions for you. H The instructors will assist the students when necessary.